How is cancer diagnosed? 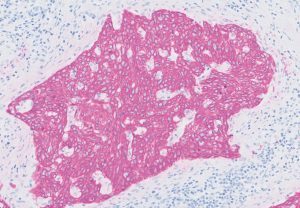 After primary staining, which determines whether cancer is present, immunohistochemistry (IHC) is usually performed as an aid in the classification of the cancer. IHC uses antibodies, which bind to specific antigens in the tissue. This antibody-antigen reaction is then visualized using an enzymatic reaction, resulting in a coloration of the cell structures that contain the antigen. A microscopic evaluation of the tissue is performed by a pathologist to provide the patient with a diagnosis. Now, Agilent has announced the release of a new color that provides even better contrast: HRP Magenta for Dako Omnis. The excellent staining characteristics of the new chromogen make it particularly useful for assessment of skin and lung tissue. HRP Magenta has a transparent nature, yet is clearly visible, distinct and intense. This allows the pathologist to recognize tissue structures and cellular details even in strongly stained cases. Nuclei can be easily identified, and all details are visible. HRP Magenta is designed for use on Dako Omnis, Agilent’s flagship instrument for immunohistochemistry and in situ hybridization. 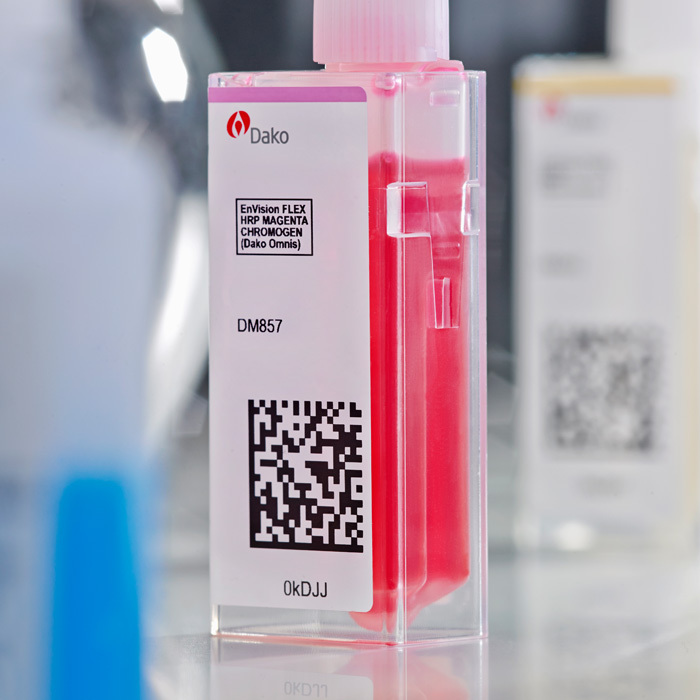 The new chromogen enables laboratories to stain with two colors: brown and magenta. This added flexibility is expected to enable quicker turnaround times for faster patient diagnoses. Squamous cell carcinoma of the lung. Stained with Anti-Cytokeratin 5/6.